After years of watching TED videos, I have accumulated many favorite talks whose lessons have stuck with me and changed the way I perceived the world. However, at TED-Ed Weekend, the experience of seeing TED Talks live and by people my own age was more visceral and inspiring than anything I had seen onscreen. In our second workshop of the day, my group was asked to describe what TED meant to them. As one of the few attendees who was not a member of a TED-Ed Club, the Saturday conference was the only experience I had with TED IRL. I thought about the answer to my workshop leader’s question, and asked myself why those morning talks had moved me so much. I am exposed to ideas daily from interactions with teachers, parents, friends; but what makes some forms of communication more meaningful than others? The best answer I could come up with was that while many of us young people have interesting — or even world-changing — ideas, it can be challenging to express those ideas in ways that effectively reach other people. 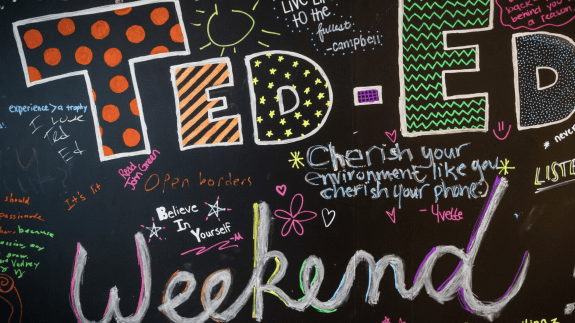 It’s hard to convey feeling through something as concrete and limited as language, but this is where most of the TED-Ed Weekend talks excelled. Because the talks were so carefully considered and geared toward the audience, I found myself getting excited about topics I had very little knowledge of, or didn’t even know existed before the conference. Even more impressive was how the topics ranged so widely from the importance of loving your natural hair to the benefits of solar energy. In addition to TED’s power to help students articulate and organize their ideas, TED offers students a unique platform to share their stories. I’ve heard adult after adult complain, either in news articles or in person, about how the art of listening is lost on my generation, but the TED-Ed Clubs format flies in the face of that accusation. As I watched the talks, it was really refreshing to surrender my attention completely to the speaker and not have the pressure of having to respond immediately. Instead, I could just let the talk sink in and process it on my own. This relationship between the audience and the speaker defines the TED experience as both communal and personal. That is what TED means to me. Author bio: Sophie Hayssen is a student from New York City and an intern at Clover Letter. When she’s not studying, she spends her time wandering aimlessly through bookstores and wasting away her youth watching Netflix. You can read more of her writing here.